Newport's mysterious Old Stone Mill stands in Touro Park just off Bellevue Avenue. Was it built by Norse explorers who arrived here before Columbus? Some people think so. 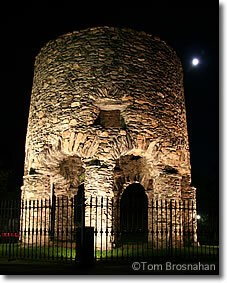 Others claim that it was built by an early governor of the Newport colony. In any case, it's a treasured landmark and bit of history at the center of Touro Park just off Bellevue Avenue across the street from the Newport Art Museum (Map of Newport). Walking through the park one October evening (not long before Hallowe'en), I was struck by its eerie, ancient appearance as a full moon rose on its right. 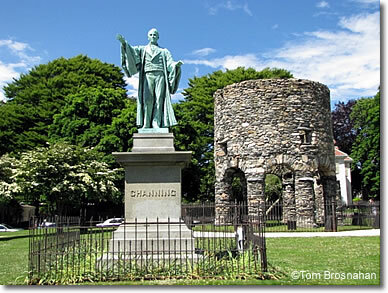 During the daytime, however, the local spirit is Newport-native William Ellery Channing (1780-1842), New England's greatest Unitarian preacher and theologian. The eerie Old Stone Mill in Newport RI.